By using the very latest in digital imaging techniques, Max Spielmann offer a vast range of professional photo restoration and manipulation services for colour and black and white prints, negatives and slides. If your photos have been damaged we can fix them! 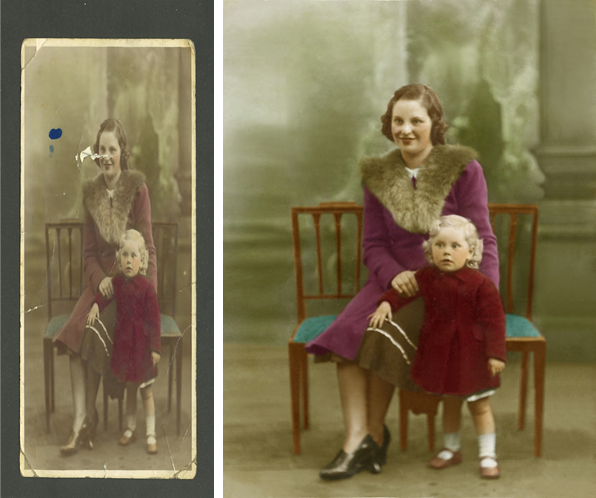 Bring in your photo, we'll scan and let you take away the original whilst we restore. Make something of your new, vibrant images and have them framed or printed onto a gift for a loved one whilst you wait. We can even colourise old black and white photos! Prices start from just £45.00 and all restored photographs are sent back on a CD so that you can email the restored images to friends and family or put them on your favourite social network like Facebook as well as ordering photos, enlargements, posters and personalised photo gifts.